For GOP, Obama's 'Very Ideological' Speech Not Wearing Well : It's All Politics If President Obama's second inaugural speech did anything for conservatives, it was to reaffirm their suspicion of the president as an unreconstructed liberal. After a day of reflection, former vice presidential opponent Paul Ryan said it showed Obama as a "proud and confident liberal progressive." 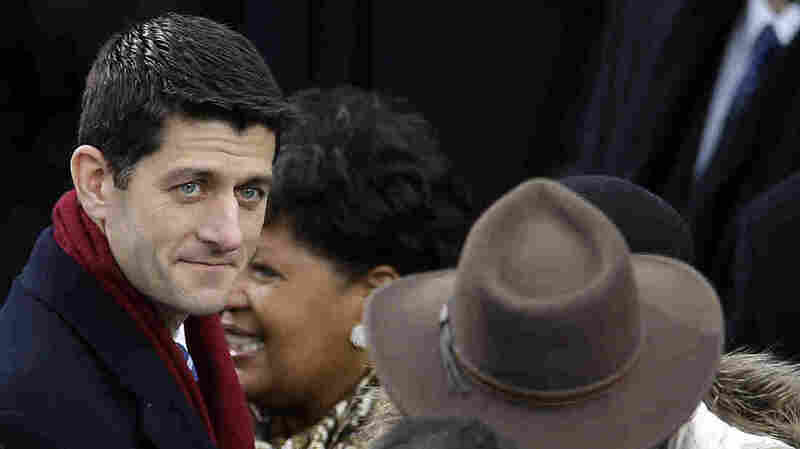 Rep. Paul Ryan, R-Wis., arrives at President Obama's inauguration Monday on Capitol Hill. On Tuesday, Ryan, who ran for vice president on the losing Republican ticket last year, said Obama's inaugural address showed a "proud and confident liberal progressive." If President Obama's second inaugural address did anything for conservatives, it was to reaffirm their suspicions of the president as an unreconstructed liberal with whom they won't find much, if any, common ground during his just-started second term. A day after the president's speech, that view appeared to be hardening. "That's what speechwriters or historians usually note, that inaugurals are meant to be that: Campaign's over, bring everybody together and try to unify. That's not the speech we got. "To be candid, I wasn't really surprised by the speech. The president is a proud and confident liberal progressive. He invoked the Constitution and Declaration at times, which is something everybody likes to hear, especially conservatives. But he invoked them sort of as a means to legitimize the agenda he has going forward, which is very partisan, very ideological, for sure. It doesn't surprise me that he did that because he's basically saying: 'I'm a liberal and I'm going to govern as a liberal and I won and, so there.' "
Ryan, chairman of the House Budget Committee, accused Obama of badly misstating the Republican position on entitlement beneficiaries, saying GOP policymakers don't label those who receive "earned entitlements" like Social Security and Medicare as "takers." Instead, Ryan said, conservatives are talking about beneficiaries who receive entitlements like Medicaid — the joint federal-state program that pays for health care for the poor — which they didn't pay for through payroll taxes. The guest host filling in for Ingraham didn't ask Ryan how he would label the middle-income elderly who get their long-term nursing home stays paid for by Medicaid. After having a night to sleep on the president's speech, Senate Republicans alleged on Tuesday that Obama, freed from having to run for re-election, finally revealed to the world how much of a liberal throwback he actually is. "One thing that's pretty clear from the president's speech yesterday — the era of liberalism is back. An unabashedly far-left-of-center inauguration speech certainly brings back memories of the Democratic Party of ages past. If the president pursues that kind of agenda, obviously, it's not designed to bring us together and certainly not designed to deal with the transcendent issue of our era, which is deficit and debt. Until we fix that problem, we can't fix America, and we cannot leave behind for our kids the kind of America that our parents left behind for us." "Well, we were reminded yesterday that this is a liberal president with a liberal agenda, which is why the words 'spending' and 'debt' probably weren't included in that speech. "We happen to believe that the biggest threat to America's future is runaway government spending, debt that we're piling on the backs of future generations of Americans." Meanwhile, Crossroads GPS, the nonprofit linked to Karl Rove's American Crossroads political action committee, was back in campaign mode Tuesday with a new video that sought to damn Obama by using the words of journalists and pundits who described Obama's speech as embracing a liberal agenda. "If the media is calling Obama's policies liberal, what can we expect in the next four years?" is how the video ends. The conservative reading of Obama's speech, such as that by Nicholas Eberstadt, an American Enterprise Institute scholar, suggests why the president can be viewed as having antagonized Republicans. He detected a take-it-or-leave-it defiance on Obama's part. The president's "argument is that we have finished discussing the welfare state," Eberstadt said in an interview Tuesday. "We are not in the 'if you have a better idea let me hear it' portion of the show anymore." "It's also strikingly different from the previous Democratic president, from President Clinton, who talked about, 'mend it, don't end it,' " said Eberstadt, who wrote a blog post taking issue with the president. "What's missing here is any notion that there's anything to be mended. No problems." "Sen. Rob Portman, R-Ohio, gushed about the civility of the ceremonial lunch Monday but indicated that his party's disappointment with the president's inaugural speech could boil over the next time he pays a call to the Capitol.
" 'Parts of it sounded more like a campaign speech and part of it was soaring rhetoric, which was positive, I thought, about getting together,' " Portman told Roll Call. He noted he is "absolutely" looking to the State of the Union on Feb. 12 — three weeks from Tuesday — to hear more details.